On a completely abstract level, if you had a choice between using proprietary software on OS X, or installing Windows in order to use some open source software which for some reason only runs on Windows, which would you do? I suppose the answer might turn on how good you think OS X is (partially open source, prettier, easier to use, less crufty) and how much you hate Windows, but perhaps this question is more complicated than that? Frequently I find myself waiting for the nightly builds of some open source program to fix some bug, or to add a feature that doesn’t exist in the stable version of the software. It would be wonderful if there were a good way to be notified when a bugfix or feature appears, either in the unstable or stable versions. For instance, right now I need some open source software that can capture a screencast from the output of my computer screen. VLC is supposed to support this, but that feature does not work in the stable version on OS X. The next version of VLC, 0.9.0, will apparently have a GUI for recording output from an iSight camera or your screen, but although the GUI is there in the unstable builds, it doesn’t succeed in saving to a file yet. I would like to be notified when VLC supports recording screencasts on OS X. For another example, I would like to start using Thunderbird 3 with the Lightning calendar/todos add-on… Thunderbird 2 has been boring and stagnant for a long time, and I’d like to help the Thunderbird 3 effort in any way I can, at least by testing the nightly builds. However, there is a showstopper bug which prevents you from switching back and forth between the mail pane and the calendar pane (it gets stuck in calendar mode), and until that is fixed Thunderbird 3 is unusable for me. I have subscribed to the bug so I get an e-mail every time someone submits a patch or makes some uninteresting comment on the bug, but really I just want to know when the darn thing is fixed so I can use Thunderbird 3 again. I don’t want to get all of this extraneous e-mail. What I’m imagining is a sort of social networking interface, or perhaps a Digg/reddit voting interface like Ubuntu Brainstorm, for bugs/features, where you can get a feed for each bug / feature request, or “friend”/”favorite” them on the website. Then you can either track all activity on the bug/feature request, or simply get a single update e-mail when the bug is fixed or the feature is implemented. This would be really awesome as a global interface for all open source projects, but a more realistic goal may be for something like this to be released as an easy to use/install open source package which all projects use and thus the interface is at least familiar even if it is not a single interface/website for every project under the sun. I’m trying to split up the bill from my last trip to Target between Karen and myself, and it is rather difficult because I’m having trouble decoding the cryptic labels on the receipt. 300PC ALUMIN = The poker chips+cards that I bought for the semi-weekly poker nights my law school friends have. They are in an aluminum carrying case. RISK BOOK = A Risk game in a box with a book-like form factor. 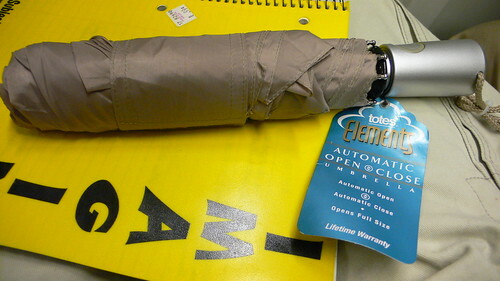 AUTO OPEN = An umbrella which has a button that automatically opens the umbrella and automatically collapses it if you press it again (sadly you still need to manually retract the umbrella after collapsing it, but it’s still cool). You’d think they could say “umbrella” on the receipt, though. I’m guessing we bought 3 packs of batteries, but couldn’t they be a little more descriptive? Like, what kind of batteries were they? Yes, merchandise. I bought merchandise at Target, big surprise. BUT WHAT KIND OF MERCHANDISE WAS IT??? I have been very disappointed in my law school grades the last two semesters. My highest grade 1st semester was a B+ in Torts, and my highest grade this semester was a B+ in Criminal Law. This is unacceptable. I have decided that I will not shave my face again until I land at least one grade of an A- or above in a law school class. This could be a relatively brief beard-growing episode, since I am taking a class on Copyright at the law school this summer. My final exam is in 5 days on July 10th, and hopefully I’ll have my grade back around the beginning of the semester. I could get an A in that class and terminate my beard after about a month. Or I might not get an A until the end of the fall semester, which could mean growing my beard into January or beyond. But hopefully it will end sooner! More posts to follow about the details of beard growing when I find time to research it. If you or any of your friends are looking for an apartment in the DC area, check out my Craigslist ad for a room in my 2BR/2BA right next to the Virginia Square metro on the orange line. Constructive criticism for the Craigslist ad is also welcome, it’s never too late to make it better! I still can’t believe what a useless POS iMovie ’08 is, and I can’t believe that Apple hasn’t fixed it by now. It was released in August 2007, it’s been almost a year and Apple has released several point releases for OS X since then. Would it be so difficult for Apple to open iMovie ’08 up to 3rd party add-ons so that people can put back in the features that Apple removed? The loss of slow-motion/fast-motion is really killing me. Oh well, back to iMovie ’06 HD. I guess Microsoft isn’t the only company that releases “new and improved” products that are actually downgrades. UPDATE: I just realized what iMovie ’08 reminds me of: the Matrix sequels. It has lots of potential, but none of it is realized; it has plenty of good ideas, but the implementation of them is horrible.